Wresat (Weapons Research Establishment Satellite), built within 11 months by the Australian Weapons Research Establishment, was launched by a surplus Redstone Sparta launch vehicle from Woomera into a 198 km × 1252 km orbit inclined at 83 deg. The 45 kg Australian microsatellite transmitted for 5 days. It reentered after 42 days. As such, these sensors were predominantly for upper atmospheric research. There were sensors to measure solar radiation, specifically three wavelengths which had the greatest impact on the temperature and composition of the upper atmosphere. The same sensors could also measure the temperature of the solar atmosphere and the density of molecular oxygen in the Earth's atmosphere. Additionally, there was a small telescope with a lithium fluoride lens which could measure the faint ultraviolet halo (GeoCoronal) that surrounds the Earth at night. For simplicity, the satellite was integrated directly into the SPARTA third stage. WRESAT was a little over two meters long and weighed approximately 72.5 kg, including the burned out rocket motor. The satellite was launched on 29 November 1967 on a Redstone Sparta from Woomera into an excentric elliptical polar orbit of 198 km × 1252 km with an inclination of 83.3°. WRESAT operated for two weeks until the batteries ran out of power. 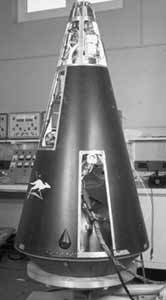 WRESAT re-entered the atmosphere on 10 January 1968 after 43 days in orbit and burned up.